Flos KTRIBE T1 Table Lamp with Transparent Polycarbonate Diffuser in Off and On Position. On the left: KTRIBE T1 with Transparent Polycarbonate Diffuser. On the Right: with Fumee Diffuser. Flos KTRIBE T1 Table Lamp with Fumee Polycarbonate Diffuser in On Position. Flos KTRIBE T1 Table Lamp with Clear Glass Diffuser in On Position. 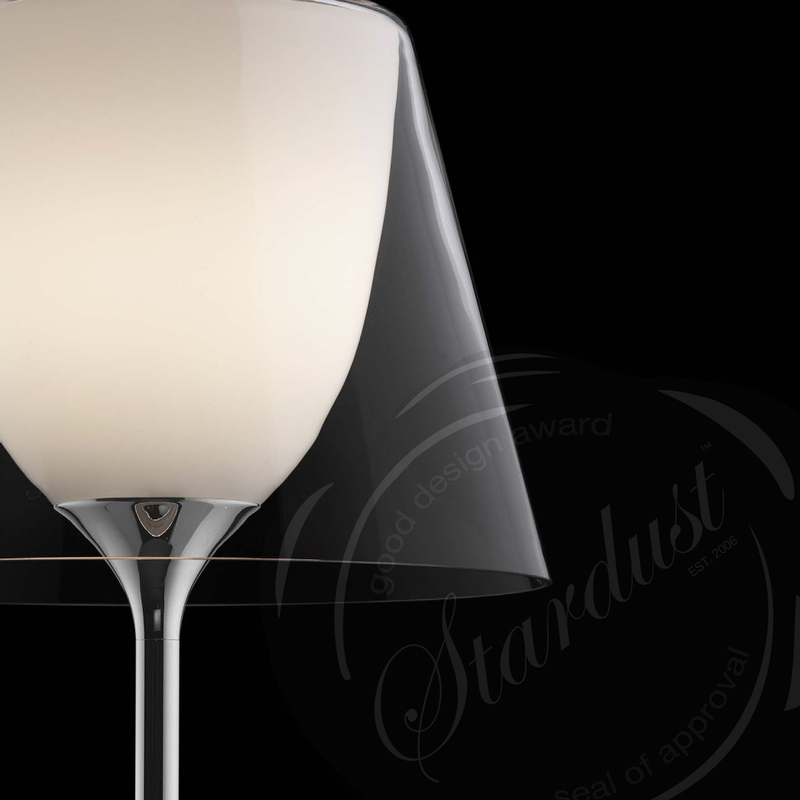 Detail of the Glass Diffuser on the KTRIBE T1 table lamp. 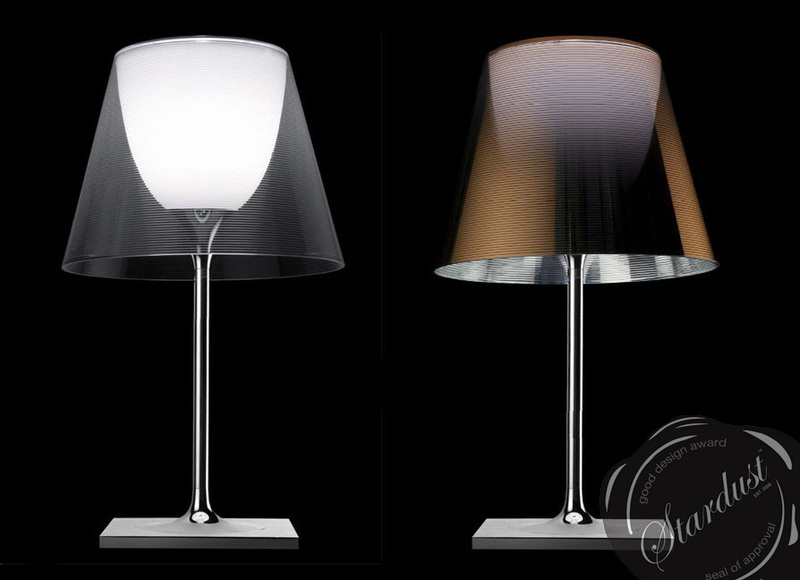 KTRIBE T Classic Glass Table Lamp by Philippe Starck - Bonjour mon Amour - je t'aime comme toujours! Let's take a closer look at the Philippe Starck designed KTRIBE T1 Table Lamp available from Stardust Modern Design. The smallest in the KTRIBE table lamp series but perhaps also the most practical one (if you want the original KTRIBE bad boy, consider the larger T2 table lamp). 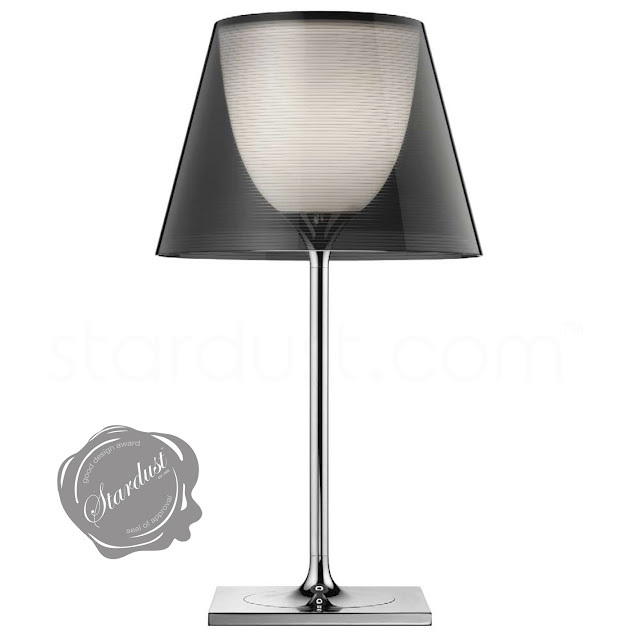 This stylish table lamp by Monsieur Strack is pretty and perfect. The Flos Ktribe T1 Table Lamp is an elegant table light fixture at just under 2' tall. Philippe Starck has a history of incorporating bold forms and classical references into his designs. The Flos KTRIBE T1 Table Lamp continues in this tradition, with a slender and elegant tulip shaped stem supporting the classic diffuser lamp silhouette uniquely executed in polycarbonate, one of the 21st century's most popular modern materials. 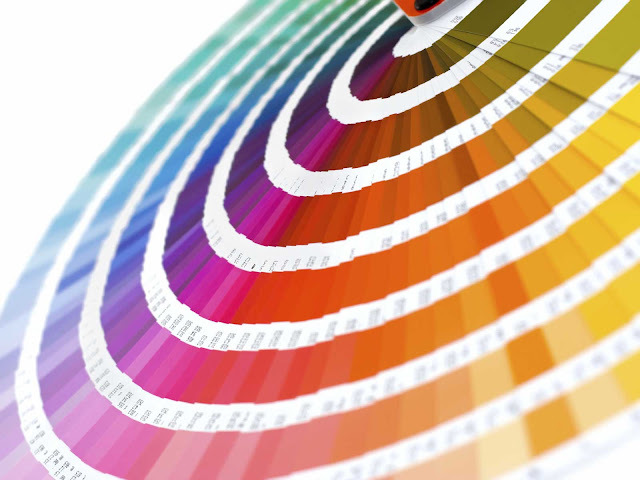 You have the choice of either a transparent or fumee colored polycarbonate diffuser. If you look closer, you will notice the decorative fine horizontal lines that are running through the diffuser. We have uploaded some images so you can see the difference between the transparent and fumee diffusers. In addition, you have the choice to opt for a clear glass diffuser (no lines in that one) for a small surcharge. Philippe Starck's KTRIBE T1 is compact enough for worktops, side tables and nightstands. 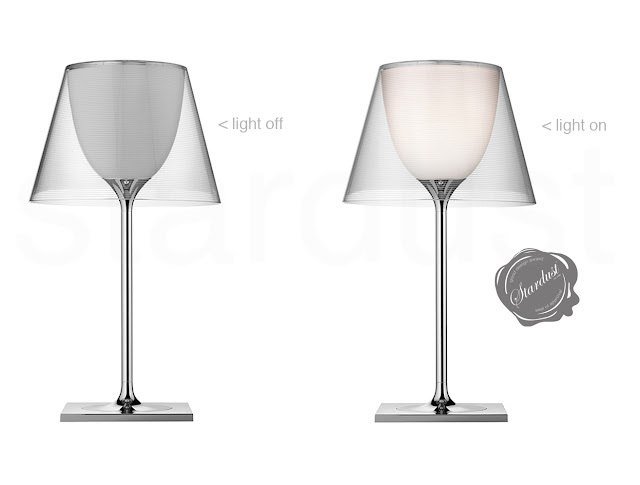 One major thing to look for in table lamps is 1) the light output 2) the light source. The KTRIBE T1 combines the best of the two! It packs a strong 1 x 100W halogen light bulb. The advantage is that the KTRIBE T1'S 100W halogen light source provides light that is strong enough to read a book by and that the light from the Halogen light bulb is gentle on the eyes (unlike CFL light bulbs which provide a more harsh light). Now for the best part; this lamp has a build-in electronic dimmer which allows you to dim the light anywhere from 0% to 100%. Zoom, zoom, zoom. Want to read a book on the architecture by Richard Neutra...zoom to the max at 100%. Want to get up at night to take a leak without waking your partner whoever that may be? No worries, turn the dimmer just a bit and it provides a sufficient glow to navigate your bedroom without knocking over everything in your way. 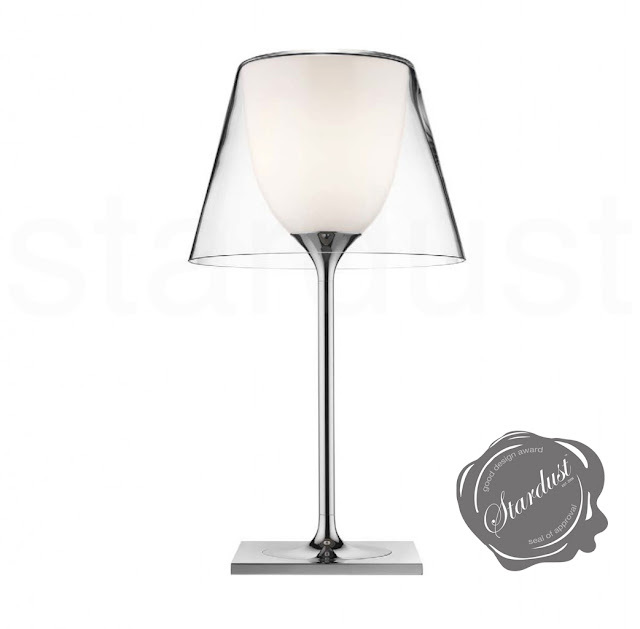 There are plenty of small table lamps out there but nothing comes close to the Philippe Starck KTRIBE T lamp! 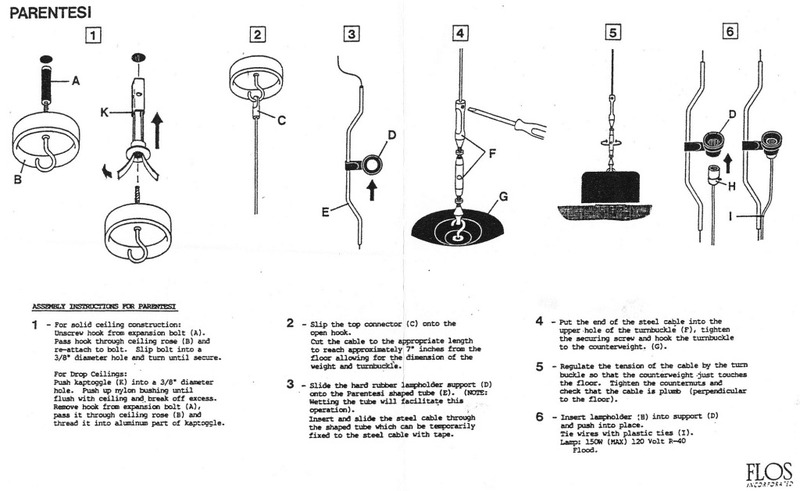 And we haven't even talked about the sleek and stylish design of the lamp yet! 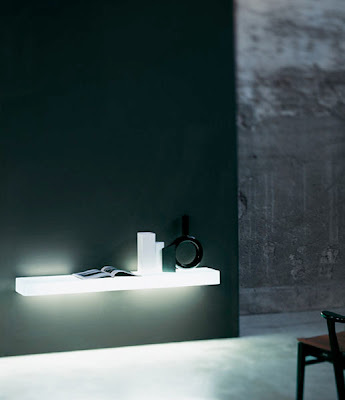 Shop Flos at stardust.com, home of the largest collection of modern design lighting online. Enjoy the web's best prices and free shipping on any time, no minimum required.